Nothing says summer quite like sitting outside and sipping your favorite ice-cold beverage on a warm, breezy day. 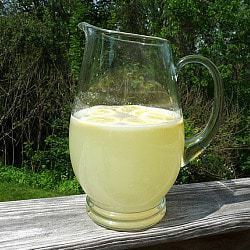 The weather has been in the 80’s here this week, and with Memorial Day creeping up this weekend, I thought this would be just about the perfect time to make a pitcher of fresh lemonade. 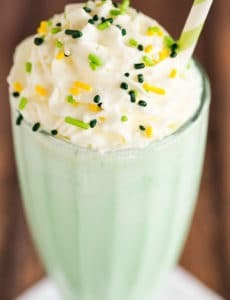 Do you have a favorite summertime drink? I love lemonade because it’s just a little sweet and a little tangy – it sort of lingers on your tongue a bit. Plus I love squeezing the juice out of the lemons the good old fashioned way – in my hands. This is super quick, so you’ll be out on the deck sipping your lemonade in no time! 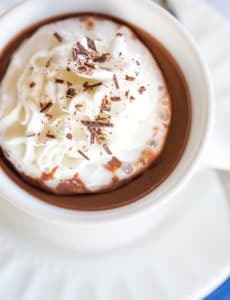 A quick note on the recipe – it calls for superfine sugar, which you can typically find at the grocery store (I have bought Domino brand before), but if you can’t find it or don’t want to buy it specifically for this, you can run regular granulated sugar through a food processor for a few seconds. The benefit to using superfine is that it dissolves easily into the liquid, so you don’t have grains of sugar throughout the drink. Honey is a great alternative to sugar. I make homemade lemonade but I make a mint and Ginger simple syrup instead of using superfine sugar. I make it with agave nectar instead of sugar. It is a huge hit. I just gave a quart of it to a friend for her son who is addicted to it. He thinks it is the best lemonade he has ever tasted. I also used my thawed Meyer lemon juice for it. Sooo good. Your recipe sounds very good too. I adore fresh lemonade. Nothing like it. 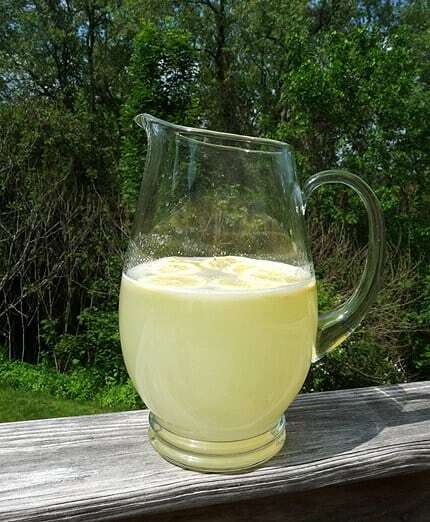 Nothing quite like homemade lemonade. This sounds really cool and yummy. My favorite lemonade recipe is infused with mint and ginger. I will post it in awhile. It is really yummy and less sweet. I find lemonade to be the best summer drink. It is so refreshing. 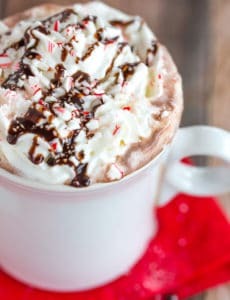 I want some of that! This looks lovely! And it’s funny that you posted it because I bought a whole bunch of lemons earlier in the week with intentions of making lemonade, but I realized I had never made it before and didn’t really know what proportions of lemon juice/water/sugar to use. Now I know! Lemonade is definitely my favorite non-alcoholic summer drink, though I like to add a little fresh squeezed orange juice and oranges slices. For a more adult drink at times – definitely a mojito. Aah. Nothing like fresh lemonade on a hot day. The powdered stuff just doesn’t compare!